A litter of 10-day-old puppies has been found dumped in a layby. A member of the public discovered 10 Staffordshire bull terriers in a plastic box in Titchfield Lane near Southampton on Saturday evening. The puppies were taken to the vet and were receiving ongoing treatment as they were completely reliant on hand-rearing, the RSPCA animal charity said. RSPCA inspector Charlotte Coggins said: "They are tiny, they don't yet have their eyes open and need help feeding. "Thankfully they are now getting the care they need and we hope they will all make a good recovery." 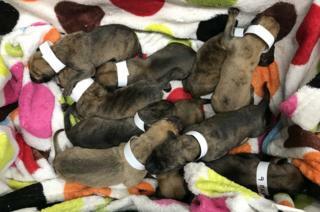 The charity remains concerned for the welfare of the puppies' mother who could be suffering from mastitis after recently having so many puppies, and to separate them from their mother at such a young age had risked their lives, it said.